The moon roof stops slightly before the fully open position to reduce wind noise. Press the switch again to fully open the moon roof. 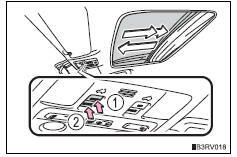 *: Lightly press either end of the moon roof switch to stop the moon roof partway.